We can’t confirm if Munich based StudioFaubel employed the grand raconteur’s advice in the development of their Martini Sessel for Müller Möbelfabrikation. The result is however equally as satisfying…..
It’s a generalisation, though we feel not a misleading one, to say that a, the, major component of Augsburg based manufacturer Müller Möbelfabrikation’s portfolio is concerned with storage in various contexts: from the Classic Line desks with their magnificence of drawers over their roll containers, secretaries, drinks cabinets and onto shelving, including the Scala system by e27, Tim Brauns launched at IMM Cologne 2017. Even the V22 coat stand by delphin design is essentially about storage. 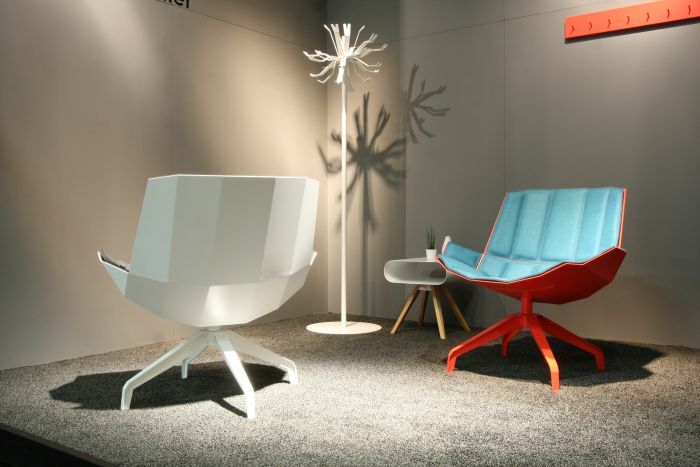 That Müller Möbelfabrikation now have a lounge chair in their portfolio is as unexpected for us and it was unplanned by them. As an object the Martini Sessel has its genesis in context of another StudioFaubel project, a project which by the nature of the challenge at hand, set Gregor Faubel thinking about a metal lounge chair. In possession of an idea, but in need of expert advice regarding the possibilities and practicalities, Gregor approached Müller Möbelfabrikation: the two have worked together on numerous projects in past, know each other and there exists a mutual trust and understanding. And through the, general, conversation about a, theoretical, chair, emerged a, concrete, plan to produce a, tangible, chair. Which is in itself an excellent example of one of the better ways to develop a furniture object: through an non-binding, open, exchange of ideas between a designer and manufacturer. The result of such a process invariably being something more honest, and prone to a longer production life, than is achieved via other processes. 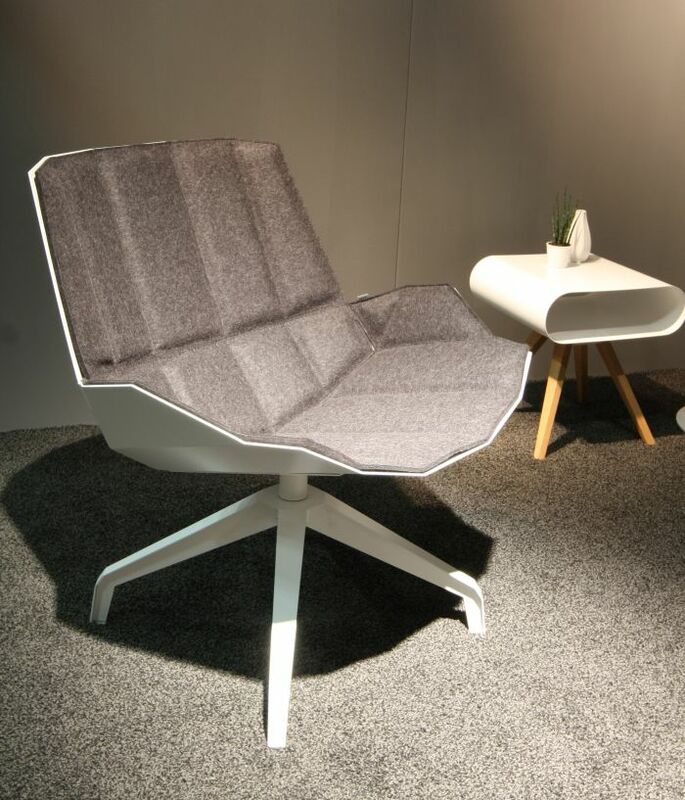 The result of Gregor and Müller’s deliberations is a voluminous, expansive lounge chair featuring an aluminium shell set atop a steel foot with padded felt cushions for added comfort; and an object which not only neatly underscores Müller Möbelfabrikation’s innate understanding of metal as a material for furniture production, but their pleasing blindness to the binds of convention. Quite aside from the fact it is a lounge chair, the major break with tradition in the project is the aluminium shell. 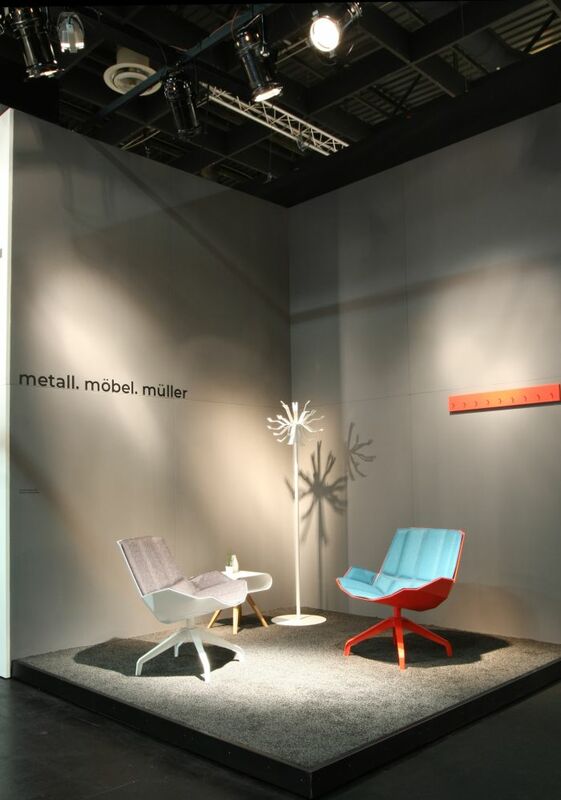 Whereas Müller Möbelfabrikation have used aluminium in the past, its use in the Martini Sessel is the first time it has taken on such a central, leading, role. The decision for aluminium rather than Müller’s typical steel being made on account of aluminium’s inherent flexibility: the shell moves very slightly with you, it’s not exactly a cantilevered effect but in that general direction. And equally as satisfying. On account of the construction process and resulting visual effect there was invariably a lot of talk in Cologne about origami and folded paper, and certainly the thinness of the aluminium and the stringent geometric blocks resulting from the folding process give the chair the unmistakable air of being a paper model of a chair …… and of something else……..
Something we just couldn’t put our fingers on. Until we got back to the office and looked at the photos: the folded paper “colour catchers” presented by Hella Jongerius in her exhibition Breathing Colour at the London Design Museum, and which through their form help explain how our perception of colour is affected by the way light strikes a surface and those objects placed in their vicinity. That colour ≠ colour. The same effect is produced on the back and underside of the Martini Chair. A state of affairs which means that while Müller Möbelfabrikation can provide the chairs in any RAL colour, the appearance will always be dependent on where, when and how it is placed. Which is most pleasing. And perhaps an invitation to offer the chairs in colour recipes more responsive to light, that can make better use of the chair’s natural geometry. In addition to the sitting comfort, the accessibility and familiarity of form, and the understated monstrosity of the object, what is also particularly pleasing about the Martini Sessel is that by necessity of the production process the shells are welded in places; thus allowing a continuation of the Müller Möbelfabrikation tradition of showing your working, of allowing their objects to proudly present the scars that indicate that here one is dealing with handmade production, and which are by extrapolation your guarantee of quality. As an object we can well imagine the Martini Sessel working equally well in a hotel lobby, office waiting room, department store changing room, business lounge, etc, as in a domestic space, complete with a favoured book and an agreeable wine, beer, tea, smoothie or gin based cocktail, shaken, stirred, or waved in the general direction of Italy.